Cloris Leachman is so awesome. My heavens, what a hardworking professional! Maybe you remember her Academy Award-winning turn in The Last Picture Show. Or the time she won an Emmy for her portrayal of Mary Tyler Moore’s nosy neighbor, Phyllis. How about the two Emmys she took home as the weirdest granny of all time in Malcolm in the Middle? At age 85, she is the best thing about The Fields, an eerie slow-burner co-directed by Tom Mattera and Dave Mazzoni. Based on an occurrence from writer Harrison Smith’s childhood, the movie is set in 1973, and follows Steven (Joshua Ormond)—an angelic kid with hair like Robert Plant—as he’s shipped off to live with his grandparents in the sticks, after he witnesses Dad (Faust Checho) point a rifle at Mom’s (Tara Reid in an awful wig) noggin. Enter Grandma Gladys (Leachmen) and Grandpa Hiney (Bev Appleton), who welcome the lad to their decrepit farm, surrounded on three sides by enormous (and dead) cornfields. Gladys tells young Steven to avoid the fields (“We’ll never find ya in there, at least till you’re all black and swollen,” she warns.) but kids never listen. On the other side of the cornfields is an abandoned amusement park currently occupied by a Manson-like cult of evil hippie girls. On the other side is a milk farm where Eugene (Louis Morabito), a dead ringer for Manson, works as a hired hand. Slowly, and with the inevitability of a bad dream, Steven finds himself surrounded by sinister forces. If The Fields had just a smidgen more action or frights, I would be shouting my praises from the rooftops. As it stands, it’s a very watchable feature with an assortment vividly haunting touches. Directors Mattera and Mazzoni deftly capture the dread of being a child in an unfamiliar environment and without parents to explain life’s little mysteries: For instance, why is there a dead girl in the cornfield, and how come my cousins are deformed lunatics? And through it all, there’s Steven’s protector, Cloris Leachman, as a foul-mouthed, chain-smoking matriarch who likes to watch horror movies. 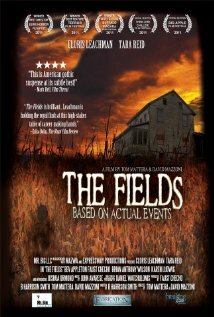 The Fields is planted on a firm foundation of truth, which makes it all the creepier.